This is a photograph of the Blue Anchor Tavern in 1920, Philadelphia’s first tavern, founded in 1681. Located at Front Street and Dock Creek (Dock Street), the tavern stood for more than two centuries and served as a place of hospitality and refreshment for ship captains, tradesmen, and the entrepreneurs of the growing city of Philadelphia. Beyond providing food, drink, and shelter, the tavern also served as a docking point for ships, with passengers coming from and going to various points along the Delaware River. Though the Blue Anchor is no longer standing, it has a legacy as the first tavern in a city that, in 2012, had almost 1,500 bars or restaurants selling alcohol. This lithograph by Kennedy & Lucas depicts the London Coffee House as it stood in 1830. Founded in 1754 by William Bradford, a Philadelphia printer, the coffee house occupied 2 South Front Street, and was partially funded by Bradford’s publication, Pennsylvania Journal. 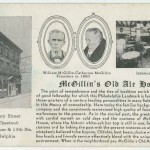 Serving a mix of caffeinated beverages, as well as alcohol and small meals, the establishment quickly became a popular location for Philadelphia’s merchants to do business. Some business deals were more respectable than others, as the Coffee House, and the vacant lot next door, were the site of Philadelphia slave auctions from the 1750s until after Pennsylvania’s gradual abolition law was passed in 1780. During the Revolutionary War, the Coffee House closed from 1778 to 1783. Upon reopening, the previously popular venue suffered economically and closed permanently in 1791. The building was converted in to a residence and general store. As the London Coffee House grew in popularity, it became clear to the owners that they would require a larger structure to accommodate their influx of patrons. 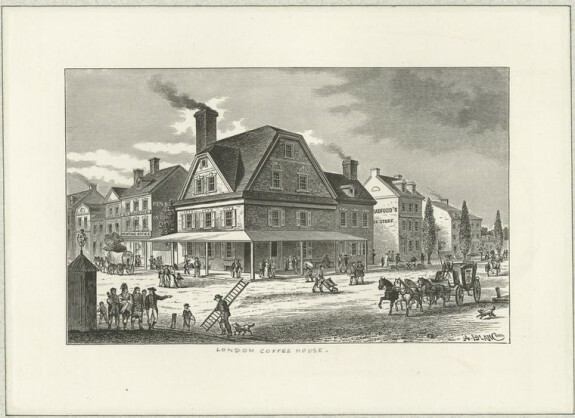 In 1773 the Merchant’s Coffee House, later renamed the City Tavern, opened on Second and Walnut streets. 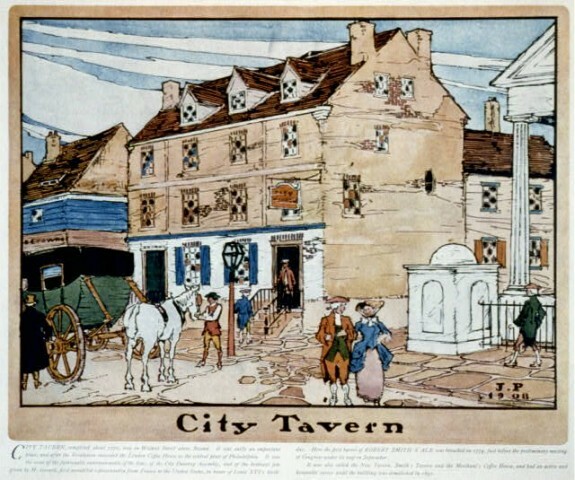 Pictured here is an artist’s rendering of the tavern and the surrounding, busy streets, created for the Robert Smith Ale Brewing Co. Many politicians, including the nation’s founders, patronized the restaurant and bar. In fact, John Adams once called it “the most genteel tavern in America.” A multi-room establishment, the tavern allowed diners to hear classical music in one room, enjoy fine dining in another, and in still another have a cheap pint of beer while discussing the latest livestock prices. A favorite haunt of Philadelphia’s thinkers and decision makers, the tavern was the site of the July 4, 1777, celebration of the first anniversary of the signing of the Declaration of Independence, as well as the location of George Washington’s 1789 inaugural celebration in Philadelphia. In 1834 a fire badly damaged a portion of the building, and in 1854 the entire tavern burned to the ground. However, the tavern was recreated in the 1970s and re-opened in time for the 1976 Bicentennial. The replica City Tavern, a popular Philadelphia tourist destination, serves meals and beverages in the style of the original eighteenth-century establishment. 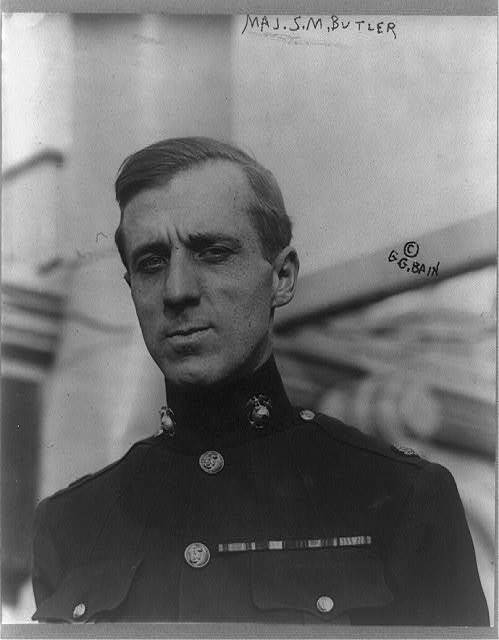 In this photograph from 1910, Major Smedley Butler of the U.S. Marines (later to become Major General) looks thoughtfully at the camera. Born in West Chester, Pennsylvania in 1881, Butler had a thirty-four-year career as a Marine. He participated in military action in China, Central America, France, and many other countries. In 1924, Butler was asked to serve as Director of Public Safety for the city of Philadelphia, near to his home in West Chester. The city government was notoriously corrupt, and Butler, a man with high moral standards, initially refused. However, after President Coolidge requested his service, the General took the job. During his time in city government, Butler made it clear that he was not on the side of corruption. He fired corrupt officers and ordered raids on more than 900 speakeasies, closing or destroying many of the illegal drinking establishments. Though Butler cut crime rates and cleaned up the city, the attack on alcohol was too much for Philadelphians and the General fell out of favor quickly, resigning after only two years. 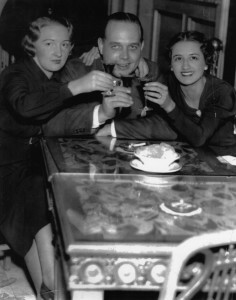 This photograph, from December of 1933, shows a Philadelphia man and two women celebrating the repeal of Prohibition. Alcohol was illegal for fourteen years and when the passing of the twenty-first amendment repealed the eighteenth amendment, celebrations were held across the country. Though taverns were once predominantly male dominated spaces, the desire to consume alcohol in secret forced men and women in to close quarters together. After the repeal of prohibition, speakeasy culture influenced the way men and women participated in nightlife. Many taverns ceased to be male only, and led to the modern bar of the twenty-first century, where men and women often drink and socialize together. 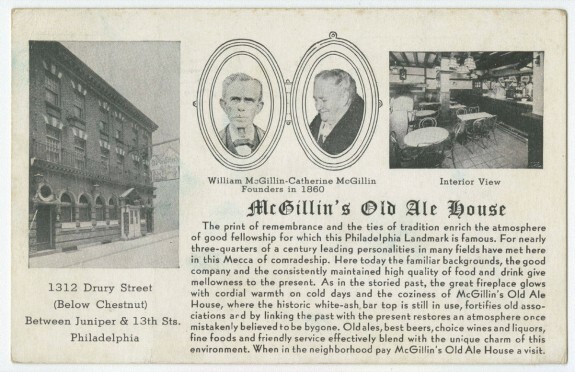 From small operations in the colonial era to elaborate social spaces in the twenty-first century, taverns in and around Philadelphia have been vital institutions, offering respite, nourishment, and camaraderie to travelers and patrons. Over time, attitudes and laws regarding the consumption of alcohol altered the character of the tavern and gave rise to modern hotels, restaurants, and bars. Early taverns, also known as public houses, inns, or ordinaries, provided travelers with lodging, meals, and social interaction. Philadelphia’s first, the Blue Anchor, appeared in 1681. By 1744, the city contained more than one hundred taverns and an unknown number of illegal tippling houses, leading a Grand Jury to demand licensing and maximum prices for alcohol. License applicants often were impoverished men and women whom magistrates viewed as unable to uphold the law. Yet because of the city’s tendency to ignore licensing requirements, critics of the law judged the policy as a failure. Taverns also appeared in many surrounding towns before 1800, including the Ferry Tavern in Camden, Wonderly’s Inn in Fort Washington, the Almonesson Inn in Deptford, Jessop’s Tavern in New Castle, and Daveis’ Tavern in Chews Landing. These early taverns usually were male-owned and served as places for discussions of politics, trade, and culture among merchants, statesmen, free blacks, laborers, and the clergy. As the region grew, tavern patrons separated along class lines; merchants gathered at the London Coffeehouse, the political elite sipped Madeira at the City Tavern, stevedores and sailors frequented the Four Alls for pints of ale, and farmers patronized country inns. In many taverns, serving slaves or Native Americans was frowned upon. Along with these distinctions, medical professionals, enlightened thinkers, and lawmakers believed that taverns and even drinking itself threatened public health. After independence, taverns’ communal lodgings and washbasins fell out of favor with the rise of hotels. 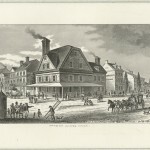 In 1790, Oeller’s Hotel, Philadelphia’s first, opened on Chestnut Street. Offering higher degrees of privacy and cleanliness, hotels minimized the lodging aspects of taverns. Yet even after the national capital shifted to Washington, new taverns continued to appear. By the mid-1820s, Philadelphians on average consumed annually 9.5 gallons of hard liquor plus 30.3 gallons of hard cider. With many drinking establishments in and around the city, a temperance sensibility, first articulated in the 1780s by prominent physician Benjamin Rush, took shape in Philadelphia. In the 1840s, the region’s expanding factories required ever more workers, many of whom were newly arrived immigrants. This growth increased the variety of spirits available in taverns, including Irish stouts and ales, Scottish whiskies, and German beer. Over time, as more immigrant groups arrived, their Old World drinking habits changed as they were exposed to American practices. Yet the growth also sharpened socioeconomic inequalities. To alleviate the miseries of the poor, many taverns provided glasses of rum for a single penny. By 1841, Philadelphia contained more than nine hundred licensed taverns. Social reformers worried about masses of workers drinking cheaply and engaging in immoral behavior. The temperance movement strengthened to more than twenty active groups totaling 7,000 members. In 1854, Timothy Shay Arthur (1809-85) penned Ten Nights in a Bar Room. Based on his observations of Philadelphia’s taverns, Arthur’s novel served to further demonize alcohol. Following the Civil War, temperance received new attention. Progressive reformers linked drinking to deviant conduct while factory owners felt concern about inebriated workers. By the 1880s, the tavern had devolved into the saloon, a drinking hall devoid of lodging spaces. Saloon owners offered basic food items such as meats, bread, and Delaware oysters to entice their patrons to drink more. The preferred venue of the working classes, the saloon was a highly masculine forum for labor organizing, cashing paychecks, mailing letters, and learning about immigrant assistance programs. Activities such as gambling, boxing, billiards, and chess were conducted by patrons. But saloons also were the target of temperance advocates, who sought to stop excessive drinking as well as corrupt associations between liquor interests and machine politics. Once in office, elected officials relied on saloon owners and the liquor industry to deliver the saloon vote. Conversely, saloon voters depended on those elected officials for jobs and favors. These dubious connections enraged groups such as the Anti-Saloon League and the Woman’s Christian Temperance Union (WCTU). Reformers charged that saloons promoted crime, divorce, absenteeism from work, and alcoholism. Yet drunkenness was in reality less of a problem, as the majority of Philadelphians spent on average less than five percent of their annual income on liquor. To encourage employees not to frequent saloons, area businesses sponsored baseball teams, bicycling clubs, and excursions to the Willow Grove amusement park or the Jersey shore. Regarded as wholesome activities, these overtures were seen by many as introductions to middle-class respectability. With the onset of Prohibition, the legalized saloon became the illegal speakeasy. In 1923, the Philadelphia police estimated that some eight thousand speakeasies sold alcohol. In some cases, fire companies assisted the police with raids. Speakeasies and restaurants reopened soon after authorities left while judges reluctantly imposed even small fines. Entrenched corruption among the police, politicians, and bootleggers made enforcement a daunting task. 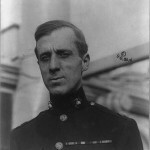 One of the most visible campaigns to rid the city of speakeasies fell upon General Smedley Darlington Butler, who in his first two days as Philadelphia’s Director of Public Safety suspended four police lieutenants and in his first year shuttered nearly 2,500 illegal liquor establishments. But by the mid-1920s, Prohibition in Greater Philadelphia had largely failed, with some 428,700 gallons of liquor released in the city every month. Several groups, including the Molly Pitcher Club and the Organization for Prohibition Enlightenment, worked actively for repeal. In New Jersey, one of three states that did not ratify the Eighteenth Amendment, the urbanized areas near Philadelphia contained numerous speakeasies where enforcement was virtually non-existent while breweries and distilleries appeared in rural locales. When Prohibition was dismantled in 1933, Pennsylvania and New Jersey adopted liquor control to monitor the trade and reduce corruption. Illegal speakeasies gave way to taprooms. In Pennsylvania, municipalities were allowed one licensed taproom for every one thousand residents. Based on 1940 population figures, Philadelphia was permitted to have 1,951 licensees. When an actual tally was conducted, results showed that the city exceeded that amount by nearly nine hundred. After World War II, vice squads routinely raided taprooms suspected of housing gambling rings, selling to minors, or being linked with organized crime. In New Jersey, some cities remained dry while others such as Camden were inundated with liquor licensing requests. As Greater Philadelphia suburbanized in the 1950s and 1960s, modern restaurants, hotels, and shopping malls emerged as places for middle-class commerce and socialization. The city meanwhile saw its bars and restaurants suffer due to laws banning the sale of alcohol on Sundays. Not until 1971, when Sunday sales finally were permitted, did Philadelphia’s bar and restaurant industry begin developing a national reputation. Following the Bicentennial in 1976 and deindustrialization, Greater Philadelphia’s economy shifted from manufacturing to one dependent upon service and entertainment. By the 1990s, the city and its suburbs contained numerous gastropubs, sports bars, ultra-lounges, wine bars, nightclubs, restaurants, and hotels, all of which sold alcohol. While the greater Philadelphia tavern in its colonial incarnation had ceased to exist, and the industry segmented along racial and class lines, the socialization that took place within them remained. Stephen Nepa teaches history at Temple University and Rowan University. He is the author of “The New Urban Dining Room: Sidewalk Cafes in Postindustrial Philadelphia,” Buildings & Landscapes: Journal of the Vernacular Architecture Forum (Fall 2011), contributing author to A Green Country Towne: Art, History, and Ecology in Philadelphia (Penn State University Press, due 2014), and has written for Planning Perspectives, Essays in History, and Hospitality and Society. He received his M.A from the University of Nevada, Las Vegas and his Ph.D. from Temple University. Berger, Molly. Hotel Dreams: Luxury, Technology, and Urban Ambition in America, 1829-1929. Baltimore: Johns Hopkins University Press, 2011. Boyer, Charles S. Old Taverns and Inns in West Jersey. Camden, NJ: Camden County Historical Society, 1962. Currell, Susan. The March of Spare Time: The Problem and Promise of Leisure in the Great Depression. Philadelphia: University of Pennsylvania Press, 2005. Davis, Allen and Mark Haller, eds. The Peoples of Philadelphia: A History of Ethnic Groups and Lower-Class Life, 1790-1940. Philadelphia: University of Pennsylvania Press, 1973. Peck, Garrett. The Prohibition Hangover: Alcohol in America from Demon Rum to Cult Cabaret. New Brunswick: Rutgers University Press, 2009. Rotskoff, Lori. 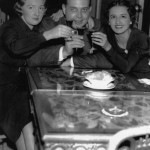 Love on the Rocks: Men, Women, and Alcohol in Post-World War II America. Chapel Hill: University of North Carolina Press, 2002. Schmidt’s of Philadelphia. Taverns of Yesteryear: Good Food, Good Drink and Good Cheer. Philadelphia: Schmidt’s and Sons, 1960. Sismondo, Christine. America Walks into a Bar: A Spirited History of Taverns and Saloons, Speakeasies and Grog Shops. New York: Oxford University Press, 2011. Thompson, Peter. Rum Punch and Revolution: Tavern Going and Public Life in Eighteenth Century Philadelphia. Philadelphia: University of Pennsylvania Press, 1999. 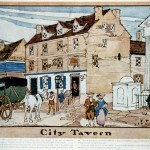 Taverns Collection and Images, Urban Archives, Special Collections Research Center, Temple University, Samuel Paley Library, 1210 Polett Walk, Philadelphia. Frederick DeBourg Richards Photograph Collection, Library Company of Philadelphia, 1314 Locust Street, Philadelphia. 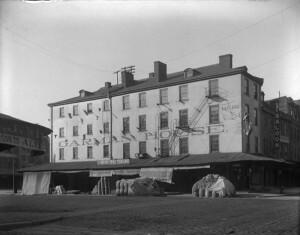 Hotels, Taverns, and Inns of Philadelphia: multiple collections and holdings, Historical Society of Pennsylvania, 1300 Locust Street, Philadelphia. Photographic Collection, General: City and Town histories, Camden County Historical Society, 1900 Park Boulevard, Camden, N.J. 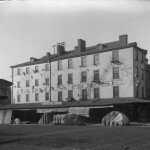 Photograph Collection: Hotels, Inns, and Restaurants, Delaware Historical Society, 505 Market Street, Wilmington, Del. The City Tavern, 138 S. Second Street, Philadelphia. The Chadds Ford Tavern, 1400 Baltimore Pike, Chadds Ford, Pa.
McGillin’s Old Ale House, 1310 Drury Street, Philadelphia. Jessop’s Tavern, 114 Delaware Street, New Castle, Del. The Cranbury Inn and Tavern, 21 South Main Street, Cranbury, N.J. There were, of course, speakeasies in Philadelphia long before prohibition. The term dates back to 1888, with the advent of Pennsylvania’s “Brooks High Licensing Act.” Kate Hester of McKeesport, PA, near Pittsburgh, was credited with coining the term. By 1890, the New York Times was explaining the Pennsylvania term “speakeasy” for illegal taverns. before Bridget Foy’s what was the name of restaurant @ 200 South St. Phila thank you . Before Bridget Foy’s (which has since burned down), 200 South St. was a Greek place called Konstantino’s Restuarant in the early 70s, then the Apollo, also a Greek place from 1975 to 1977. It then became the East Philly Cafe until Bridget Foy’s opened there in 1984. I’m curious to know the details of petitions to have a tavern license in early 1800’s. There are numerous petitions for these licenses, signed by multiple persons. What were the requirements for obtaining a tavern license in, say, 1820. Are there other documents for taverns and inns for this time period in addition to the petitions? Thank you! I recently learned that my great grandfather, William Smith, and his wife Ellen, owned the saloon at 526 S. Front St, Philadelphia, recently called Downey’s, from at least 1860 to at least 1903 when her last will and testament instructed it’s sale in the event of her death. My grandfather was born there as were his 5 brothers and sisters. They lodged 8 sailors in the rooms above the bar (according to census data) which makes my mind boggle thinking what it was like during those years. I’d like to find old photos or other information about this historic building and business. If you have any information about where I can look I’d very much appreciate it. Thank you.